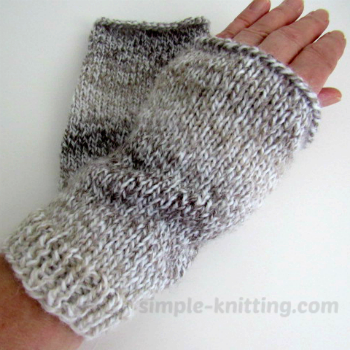 Wondering how to knit wrist warmers? This super easy quick to knit project will keep your hands and arms cozy and warm. And it's a great beginner knitting pattern. It's also a perfect beginner knitting lesson to practice the Stockinette stitch. If you suffer from achy wrists when it gets cold outside these simple arm warmers will help keep you nice and warm. I sure love them and now you can too. Arm warmers, wrist warmers, fingerless mitts all mean the same thing, cozy warm covers for your hands and arms..haha And they sure helped me a lot. Wrist warmers can be worn on their own or they're great for layering when it's really cold outside by using gloves underneath. And I like them so much I though you might enjoy making a pair for the whole family so I've created sizes ranging from children to mens sizes. That way everyone can stay toasty warm. 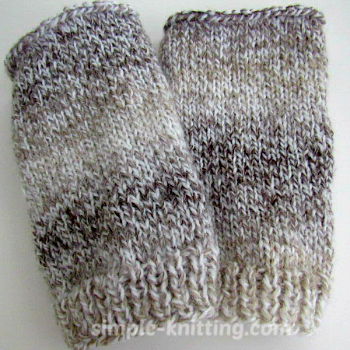 Don't forget these arm warmers will make wonderful knitted gifts too. Pick out some scrumptious yarns and just get your knit on. This is simple knitting at its best. And even though these are made in Stockinette stitch don't be afraid to experiment. Try using different stitch patterns. I have quite a few you can try. Also if you'd like your wrist warmers to go all the way up your arm just knit them longer. It's a great simple knitting pattern to practice with so have fun knitting and trying different things. For all you guys out there this is a nice easy knitting pattern for you to work on too. I know how difficult it is finding mens knitting patterns. Pick out some great yarn and start knitting a pair. Materials: 120 – 200 yards DK weight yarn depending on size. Pattern is written in the smallest size with the other sizes in brackets. Cast on 26 (32, 36, 42, 46) stitches and work 1X1 ribbing (Knit 1, Purl 1) for about 1 inch. Switch to Stockinette stitch ( knit 1 row, purl 1 row) until you reach approximately 7 inches or the length you'd like. If you'd prefer to have a ribbed top then knit until you reach about 6 - 6.5 inches, then knit in ribbing for the final inch of your wrist warmer. Bind off loosely, cut yarn leaving about 10 inches of yarn to seam up sides.